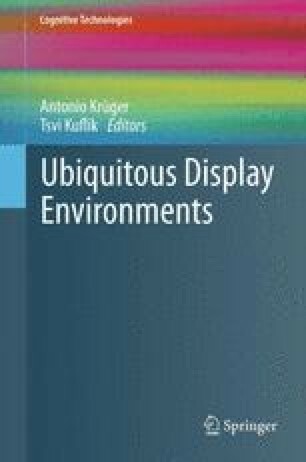 In this chapter we will discuss the relatively new research area of context-sensitive Displays. The cheap availability of display spaces in combination with sensor technologies which allows to make inferences about the context of the display will enable a multitude of novel applications. However the foundations of these sensor-display systems are not well understood. Therefore we will discuss in this chapter the basic setup and a research methodology which has helped us to systematically approach the problems we faced during the design of several context-sensitive display environments. For this purpose we will present three research systems: the iDisplay-system, a public information system which uses extensively context-filtered information to inform students in University buildings, the MobiDic-system an context-sensitive advertisement management system for digital outdoor signage and our research on the Münster Multitouch Wall, which demonstrates novel ways of interacting with large displays in public environments.